We know the value of free trade and open borders. Without the obstacles of tariffs and quotas imposed by rich countries, the gains to poor countries would be enormous, and hundreds of billions or even trillions of dollars would be added to the global economy. But in many rich countries, sustained job loss from trade is a key factor that has led to demands on political leaders to pursue protectionist policies. These types of policies are borne out of the populist discontent we are witnessing firsthand in the US presidential election and the UK Brexit vote. In the UK, the Brexit vote illustrates what can happen when people feel their job opportunities are suffering due to liberalized trade policies. In the US, there is a great deal of skepticism about trade deals such as the Trans Pacific Partnership, despite President Obama slow-jamming its benefits (“This trade deal will help put everyday Americans back to work, work…”, he sang, on The Tonight Show Starring Jimmy Fallon). The Institute for Fiscal Studies has warned that Brexit will hurt the UK economy in many ways. Others have argued that poor countries will likely suffer additional, separate—perhaps greater—negative effects (see a recent post from Owen Barder on the potential implications of Brexit for global development). But voters in rich countries seem to be sending a different message: if we want open migration and trade policies, we need to focus on domestic job losses, especially in traditional sectors such as manufacturing, shipbuilding, coal mining, and steel. In a series of papers, economists David Autor, David Dorn, and Gordon Hanson and others argue that competition from foreign manufacturers has lowered wages and increased unemployment in the US far beyond the predictions of most economists. In particular, competition from China has been devastating. Between 1991 and 2013, China’s global share of manufactured goods exports rose from 2.3 percent to 18.8 percent. Autor, Dorn, and Hanson show that in the US, the closing of manufacturing plants has had major ripple effects for suppliers and service providers, especially in the Midwest. Competition from China accounted for 44 percent of job losses in the US between 1990 and 2007. Economists generally accept that there will be winners and losers as a result of trade deals and from globalization more broadly. But they have made the fatal mistake of assuming that the losers will seek and most likely receive some form of compensation. The data clearly show that there has been limited uptake of trade-related adjustment assistance compared to the number of workers displaced (see Figure 1). 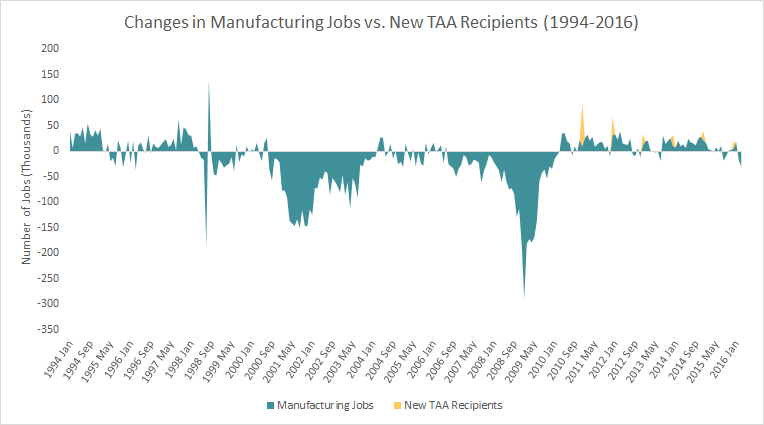 Figure 1: This figure shows all US manufacturing job gains and losses from 1994 to 2016. Manufacturing is used as a proxy, as it has been hit hardest by the post-industrial shift that has relocated jobs overseas; losses in manufacturing employment are not inclusive of all trade-related losses, nor are all manufacturing losses necessarily due to trade. New Trade-Adjustment Assistance recipients are shown in yellow (Source: US Bureau of Labor Statistics). Negative impacts from trade policies raise other questions that have not received much attention from economists. Why do workers not move to other industries or to other parts of the country when they lose their jobs? Why have they not made use of trade-adjustment programs that promise job training, relocation allowances, credits for healthcare, and other benefits? To what extent do declines in home values affect the ability of workers to move? One of the most emotionally damaging aspects of wage stagnation and job loss among working class Americans has been the growing fear that, just as they have lower living standards than their own parents, their children are likely to do even worse. Following the Brexit vote, CGD’s board chair Larry Summers wrote in the Washington Post that rich countries should “avoid backsliding toward protection” while moving toward a more “responsible nationalism.” The challenge is to implement policy solutions, such as investments in infrastructure, that prioritize domestic needs without exploiting working-class anger. These policies may serve another very important purpose—changing attitudes toward migration and trade. Regionally targeted policies offer another path to assistance that may soften the blow of job losses. For example, the Obama administration launched the POWER+ Plan in the FY 2016 budget, which awards grant funding to Appalachian coal communities experiencing economic hardship as national coal production wanes. Funding is funneled into programs that provide job training, reemployment services, subsidized employment, economic diversification efforts, and other supportive services to ease the employment transition. If we believe that children are potentially more flexible than their parents at responding to new incentives, programs put in place to compensate the losers from free trade might also be made available to the children of those affected. This suggests not only job retraining policies for displaced workers but job training and even free college for their children. One thing is clear: if we want to see poor countries get a better deal with respect to trade and migration, we need to do a lot more to tackle the problem of job losses in rich countries.